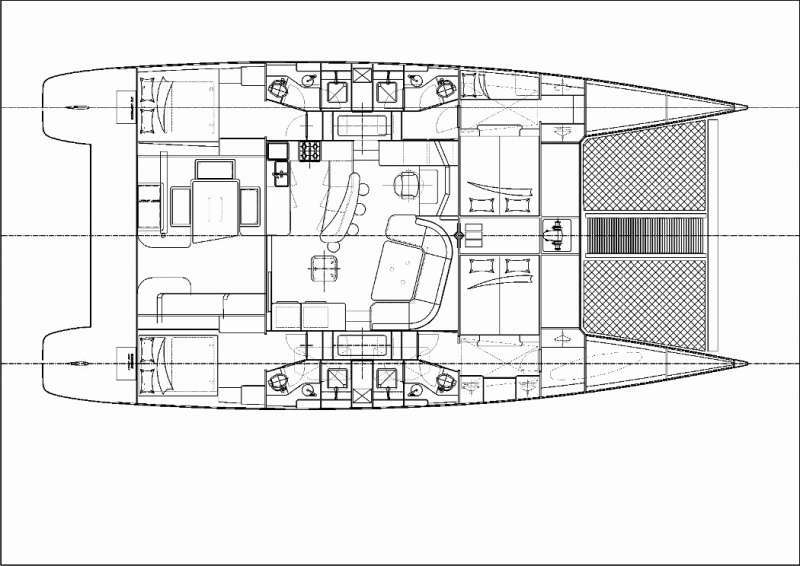 Silver Girl is a spacious, bright catamaran with wide easy to navigate decks. The yacht’s comfortable interior includes a large salon with formal dining area, entertainment area with large media library and an open galley design. Air conditioned throughout, the yacht has a watermaker, icemaker and wi-fi internet to offer all the amenities of home. A spacious covered cockpit features drop-down blinds for privacy and protection, adjustable sun awning, deck shower, and outdoor barbecue. Her spacious deck area provides guests on Silver Girl ample room for sunbathing on the foredeck trampolines, lounging in the hammock or enjoying cocktail hour with a view in the spacious cockpit. Custom bow seat provides a spectacular vantage point over the water either under sail or anchored in a secluded cove. Scuba dive from the yacht with two diving instructors. Silver Girl offers guests a 6-passenger dinghy with 15hp motor, snorkeling and fishing equipment, towing tube, paddle board, kayak and beach games. The yacht’s clean and modern deck layout, dual swim platforms for easy access to the water and watersports, and on-deck shower offers your group all you’ll need for an unforgettable Caribbean yacht vacation. Save 10% off new 7-night reservations for available dates in April and May 2019 sailing the Virgin Islands. Available 24 Apr 2019 through 10 May 2019. Contact us for rates and current availability or to book a charter aboard Silver Girl! Other Water Toys NEXUS ‘spacious and comfortable interior includes a large salon with formal dining area, entertainment area with large book, DVD and CD libraries and open galley design. Full air conditioning, watermaker, icemaker and satellite phone and email offer all the amenities of home. A spacious covered cockpit features drop-down blinds for privacy and protection, adjustable sun awning, deck shower, and outdoor barbecue. NEXUS offers guests a 6-passenger dinghy with 50hp motor, snorkeling and fishing equipment, towing tube, paddle board, kayak and beach games. Diving on board with TWO diving instructors!